You know how you read something and it strikes you as true and very funny. I have always coveted a refrigerator with a glass door. I just love the way they look. I was reading an article a while back (and I regret I have no idea who wrote it, and I am sorry) and the author made the point that having a glass front refrigerator was a stupid idea as one would not want to spend time curating their refrigerator. Of course, this made perfect sense. On any given day, my refrigerator resembles Fibber McGee's closet, one of those sitcom closets where everything in the house is stuffed into it only to fall out when it is opened. So recently, after unloading a grocery run, I looked up to notice that I had a rather nicely "curated" refrigerator that was worthy of a glass door. But only for that afternoon...still...I could get used to a $15,000 Sub Zero. Love this! I gave up my car in 1999. Partially because my son needed it when it went to chef school in Vermont and partially to help support my very early retirement. We are almost finished we our kitchen remodel (it has taken three years) and I told my husband, Mr. Sums It Up, that I wanted to rewarded for all of the money I have saved him: Yup, the 48" pro subzero, 750 pounds of stainless and glass...and gulp, it's gone up from $15,000. I don't care. It's coming to my house on Thursday. I have already named her Mrs. Patmore, after the tech reluctant cook in Downton Abbey. My husband would glad have bought me a car if I finally had caved. It took a bit of persuading for this indulgence. Almost makes cooking in a basement with one cooktop and 2 toaster ovens for the last three years worth it! OMG! Send photos so we can live vicariously! We want to see it all nicely curated! Even Mrs. Pat ore would be jealous...and greatly honored! Congratulations. That enormous cabbage woundn't fit in the bin! That's why it was sitting up there. I want you to know I love your blog and have read it for a while. 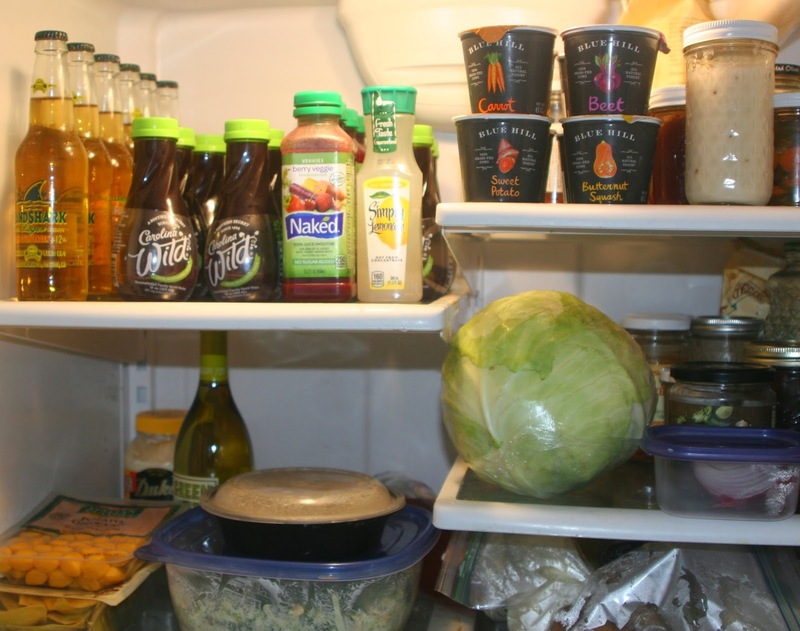 That large green cabbage reminded me that I had a large red cabbage in my fridge. I made wonderful red cabbage last night. Red cabbage when I was a child at home meant "sweet and sour" red cabbage. Even the notion that one might "curate" ones fridge is hilarious. However, I wouldn't be surprised to hear that there are overmonied people who hire someone to do just that. Myself, I will stick with my impenetrable door, but I do like the idea of naming one's appliances.